Various strings of letters are used as commands that dictate the actions of the DNS server, and these strings of commands are called DNS syntax. Some DNS records syntax that are commonly used in nearly all DNS record configurations are A, AAAA, CNAME, MX, PTR, NS, SOA, SRV, TXT, and NAPTR. A - An “A” record, which stands for “address” is the most basic type of syntax used in DNS records, indicating the actual IP address of the domain. subdomains with an existing domain's DNS records. MX - The “MX” record stands for “mail exchange” and is basically a list of mail exchange servers that are to be used for the domain. PTR - The “PTR” record stands for “pointer record” and maps an Ipv4 address to the CNAME on the host. 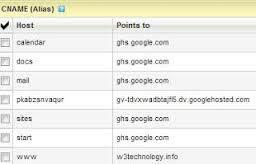 NS - The “NS” record stands for “name server” and indicates which Name Server is authoritative for the domain. when the domain was last updated and much more. SRV - An “SRV” record stands for “service” and is used to define a TCP service on which the domain operates. TXT - A “TXT” record lets the administrator insert any text they'd like into the DNS record, and it is often used for denoting facts about the domain. NAPTR The NAPTR records are commonly used with SIP in conjunction with SRV records to discover what types of service are available for a name, (such as SIP, email or web).